This one is simply a staple for any candle line. Truly a spicy and intoxicating aroma that will have your friends think you've been baking all day. We have 2 different scents from this company and love them both. They make the whole house smell great, and they take forever to burn (so you don't have to replace them quickly). I always love Our Own Candle Company candles, they've never disappointed. This candle keeps up the tradition of it. This candle is a little on the strong side though, so I find it difficult to burn for long. Well, okay the apple and cinnamon ones and apple pie are my favorites but I love the cinnamon only one, too. It is a cozy scent, perfect for fall and winter. Makes it seem as if I have something yummy simmering on my kitchen stove. Really warms up a house, it isn't smokey and you get a lot of burn time for the money. These are the best candles I have come across. They have adorable mini-mason jar candles you can get from their website. These candles were a Christmas gift but I ended up buying more for my own hom. Great products from this company. I will be buying more candles in the future! 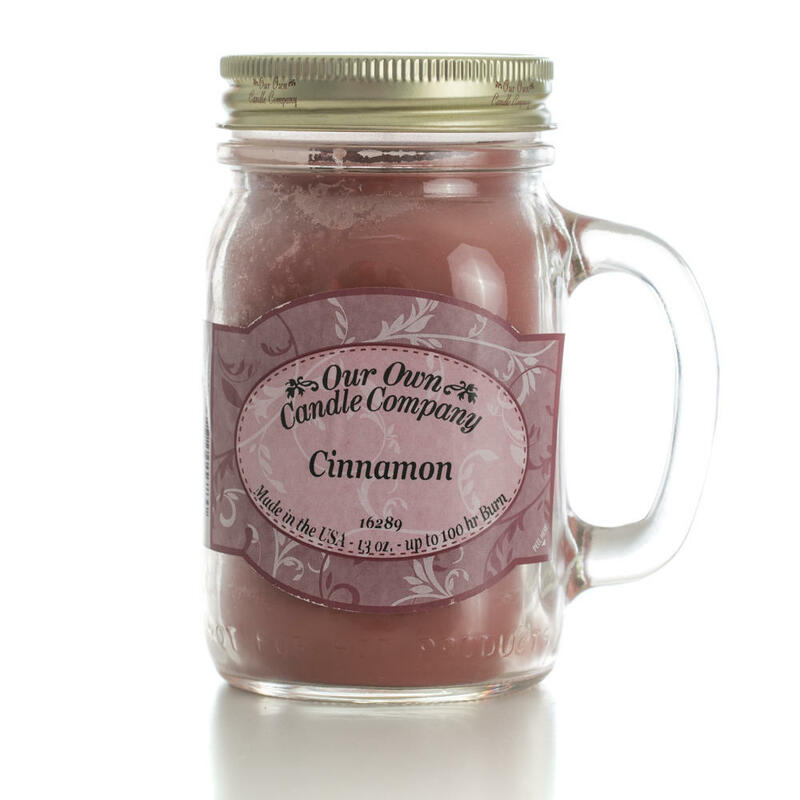 Our Own Candle Company produces a fabulous product. Very aromatic and burns for at least 100 hours, in intervals. VERY PLEASED ! Love these candles. Make good beer mugs when I'm done. Love beer, too. At 9.99 these candles are unbelieveable value, with over 100 hours of burning time there is no other candle on the market with this quality at these prices, why not see for yourself ?